Other people are asking for more screen space, I'm asking for the option to have LESS! (and expand to fill the monitor) Why? It can make better use of the Pico-8 map space and improve the level design of your game! 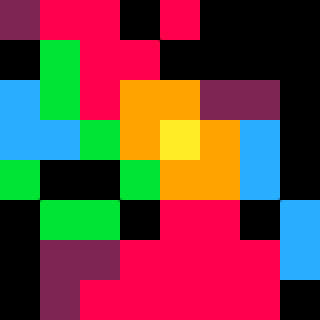 There's a 64x64 game comp with some amazing entries, you can see them here. You can see more of the game pictured above here. This inspired me - I'm now converting my game to 64x64 as it made me realise I can finally fit the map of the entire game in if I restrict each screen to 64x64 and re-design the gameplay to suit! I'm finding when I use "clip" that rather than crop the screen, I wish it could also expand to fill the available view, so I'm not playing the game in a small square in my monitor. Hopefully this feature wouldn't be too involved to implement? If I'm not mistaken, it's exactly what you're looking for. You're kidding... I'm going to try this tonight! Does this expand the screen so the coordinate system goes from 0 to 64 instead of 0 to 256, or expand the clipped area? The former - it doubles the size of pixels and shows only the first 64 in each direction. The clip() function sets a clipping rectangle for drawing, not viewing. It's for things like making sure you don't draw outside the area you're intending to modify. Yeah the former would make the most sense. And yes I imagine clip is for things like having a gameplay area while you have a HUD area outside of that which you only change when you need to, like the old Dungeon crawler games. Man this is awesome. It totally works. Thanks guys. you could always build a game with borders, with the 64x64 box in the center if thats all it is. @FoobyDude that's what I had, it's like looking at a postage stamp. But as you can see from the previous posts, the feature I wanted already exists. This is where I was looking, towards a fighting game project! :D Gotta remember where to find this. keiya: Those TAKARA games were spot-on fun, though. That's where I was hoping to go with a project.